The town of Puerto Vallarta, although originally named Puerto Las Penas (Port of the Rocks), has been around for more than one hundred and fifty years. This now world-renowned vacation paradise was originally founded by Don Guadalupe Sanchez Torres in 1851 as a shipping hub for vast fortunes of silver ore excavated from the Sierra Madre mines. The city was finally dubbed its current moniker, Puerto Vallarta, in 1918 after Ignacio Vallarta, a local government official. This quiet blue-collar fishing and shipping town gained world-wide recognition after it was featured as the setting for director John Huston's award-winning film, The Night of the Iguana. This movie -- nominated for a Golden Globe Best Picture prize in 1965 -- featured Ava Gardener and Sir Richard Burton. Burton and his beautiful wife, Elizabeth Taylor, subsequently bought a vacation retreat in Puerto Vallarta. The influx of international attention brought to Puerto Vallarta by the arrival of the Hollywood elite caused a resort construction boom in this previously sleepy port hamlet. John Huston's luxurious coastal estate, Las Caletas, is now a tourist retreat with a hillside spa. 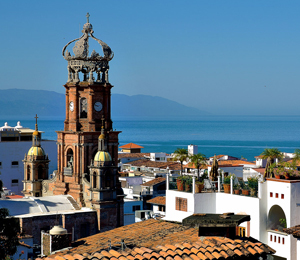 Now primarily a center for tourism, Puerto Vallarta not only allows visitors to experience a Spanish-colonial atmosphere (with cobblestone avenues and traditional architecture), lovely beaches and panoramic shorelines, and the majestic background of the Sierra Madres rising to heights two thousand feet above sea level. World-class culinary geniuses have established five-star restaurants with American, Mexican and international cuisine, emphasize freshly-caught seafood from Bahia de Banderas and the Pacific Ocean. The nightlife in this coastal getaway offers visitors a chance to unwind and forget their typical work week stress.